Pollution prevention is about source reduction and other practices that block the creation of pollutants or at least reduce or eliminate them altogether through increased efficiency in the use of raw materials, energy, water and other resources. It is also about protecting natural resources through conservation. Pollution prevention’s basic principle is that waste is the result of inefficiency, whether it is from management, production materials selection operations or the organisation’s/society’s general culture. Therefore, by reducing waste through increased efficiency, an organisation can increase its productivity. Likewise, the environmental and health benefits from pollution prevention are clear: waste that is never created does not pollute, and therefore cannot harm as there would be no need for public health authorities to take action that could possibly release into the environment pollutants or contaminants. Pollutants could emerge from the misuse or improper handling of pesticides. In urban scenarios, home applications to kill insects and weeds in lawns and gardens make up a major volume of pesticides. Programmes to prevent pesticide pollution try to limit the adverse impacts of insecticides and herbicides by disseminating information on pest control techniques other than chemicals or explaining how to determine correct dosages needed to manage pests. Lawn care and landscaping management programmes often include pesticide use management as part of their outreach message. Today, Integrated Pest Management (IPM) plans are being widely adopted. IPM coordinates practices that lessen the need for pesticide applications. The target of IPM is to eliminate problems before they arise. IPM brings together the understanding of pests’ life cycles and their environmental interactions. The plans incorporate approaches that reduce hazards to people and the environment in the most economical manner feasible. The prevention plans combine approaches such as biological control and habitat modification. Only if inspection shows that there is still a problem at hand are pesticides then applied. Formulate action thresholds: Prior to taking action to control pests, thresholds should be identified that determine levels at which pests become an actual threat to the environment. Identification and proper monitoring: Proper identification of pests is a must since not all of the organisms present may be creating the problem. Many of the organisms present may actually be beneficial in maintaining a balance in the insect community. An example of this is apparent in the aphid - praying mantis –relationship. Aiming to rid your garden completely of aphids may cause you further troubles by disrupting the food supply of the beneficial mantises. Accurate and continual monitoring will ensure whether pesticide applications are necessary and if so what pesticides should be used, enabling you to target certain pests while reducing harm to others. Prevention: The ultimate goal of IMP is to stop the problem before it starts. This is where responsibilities as a homeowner or agriculturalist come into play. Habitat modification may be required to decrease the levels of habitats favourable to target pests. In homes this may require changes such as eliminating points of entry by repairing screens, sealing all food sources, and vacuuming furniture. In agricultural settings, prevention may be achieved by carrying out crop rotation, planting pest-resistant crops and pest-free rootstock. Many pests thrive primarily on one plant species. Large concentrations of a single plant species are ideal pest breeding grounds. Plants will also maintain higher levels of natural defences against pests if environmental conditions such as moisture and sunlight levels are favourable for that plant species. Proper spacing and early morning watering will help improve health and prevent the establishment of fungi populations. Evaluations: Once the preceding steps have been taken and it is shown there will still be a problem, proper action should then be taken. Control methods which are the least harmful to the environment should be taken first. The use of natural controls is one option. If it has been determined that healthy predator populations are not present in agricultural settings they should be replenished. Natural predators such as lady beetles, mantises, spiders, and parasitic wasps can be purchased for this purpose. Another option is the use of pheromones which disturb the natural mating cycles of the pests. Sometimes trapping methods can also be employed. If further evaluation shows that the problem is still present, pesticides can then be used. Target pesticides should be used before non-specific pesticides. Biopesticides are often more favourable than conventional pesticides. They are generally less toxic and target specific versus conventional pesticides which harm other organisms ranging from insects to humans. Biopesticides can often be applied in smaller doses and decompose faster than conventional pesticides. This can lower toxic exposure levels and decrease environmental degradation and pollution. 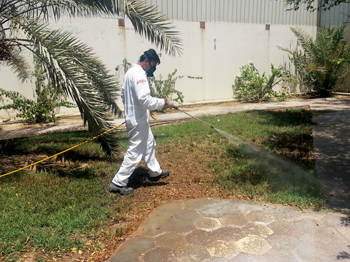 To protect health and the environment, Saudi-based Masa uses the safest techniques and equipment along with pesticides that leave no residue or cause very minimal pesticide spillage. An example of the equipment it uses is the B&G sprayer, which is designed and manufactured by a renowned company. Masa performs termite proofing which leaves no residue that can harm human health because the pesticides are buried in soil. Masa uses the latest chemicals containing active ingredients and produced by the world’s top-most manufacturers. The company is also a distributor of some products and equipment. Masa has a proven and flawless track record with 36 years’ experience in delivering quality results through use of a range of tried and tested pest control solutions. Clients get products that are in compliance with strict pest control legislation.